After years on low pay, self-organised workers at a London climbing centre have won the London Living Wage with the help of the London branch of the IWW. 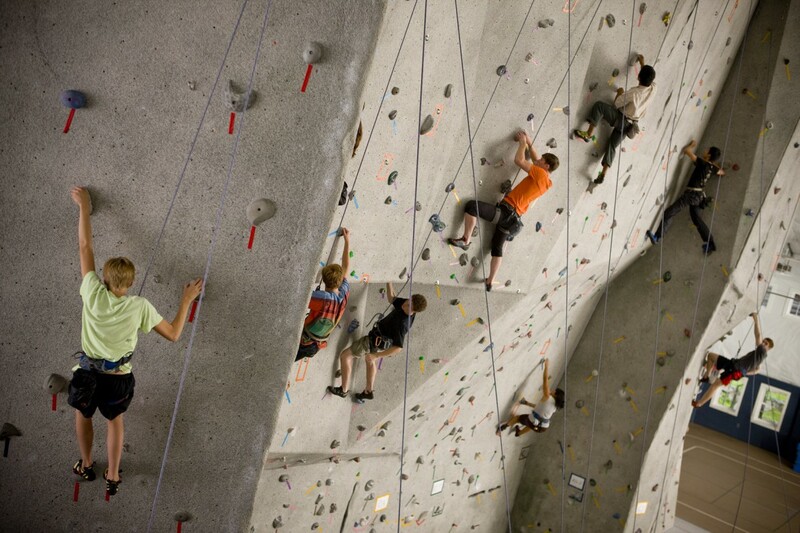 The climbing centre delivers a range of climbing courses for different abilities and ages, including bouldering (climbing without a rope above crash mats), and roped climbing. The centre also runs a café and shop. There are around 90 workers in all, one half made up of Instructors, the other half of Front of House staff working in reception, the shop or café. Front of House workers were paid well below the living wage for years. Originally receiving just £7.50 an hour, the rate moved to a still derisory £8.50, then £8.80 earlier this year. There were also longstanding problems with work conditions and shift patterns, together with a problematic relationship to management aggravated by poor communication. Initial uncoordinated attempts by workers to address these pay issues through the company’s opaque annual pay review process brought no result. The process involved no real consultation with workers, and the London Living Wage (LLW) was referred to only as “a guide”. It was effectively ignored in wage calculations. As a result workers decided to get organised, and address the issue of low pay head on. Early in 2018 after an initial meeting with management, workers got together to conduct a staff survey on pay and conditions, and drew up a document that detailed specific grievances including pay, lack of transparency regarding management decision-making, work conditions in the café, short-staffing, pressure to take on shifts, and impractical shift patterns for part-time workers. They also highlighted a management culture that saw Front of House jobs as disposable with resultant poor morale and high staff turnover. Management issued a series of poorly communicated, tardy, and piecemeal responses to only some of the concerns raised. Persistence and a united front from the workers forced a disjointed management to address their grievances in full, including the key issue of low pay. Management argued that signing up to the LLW would mean a ‘loss of control’ for them. The LLW rate of £10.20 an hour in London was considered ‘unacceptable for business’, and they were also unhappy about the calculation of the LLW. It was at this mid-point in negotiations that workers contacted IWW for support, including organiser training, and advice on their approach to the management team. Shifting from their initial position, management acknowledged that current pay levels were not acceptable, and problems with shift patterns needed to be addressed. Workers responded to a management suggestion to divide into two working groups (one focusing on ‘Wages’, the other on ‘Shift Patterns and Hours’) by putting together a structured and coherent set of proposals for change. Management remained intransigent however, offering their own bespoke calculation of a ‘living wage’ instead, and asked for worker agreement (and input into creating!) this new inhouse methodology. The workers’ response was to offer a systematic critique of the inhouse ‘methodology’. Management hadn’t really understood the detail of the LLW calculation, but once workers convinced them of the soundness of LLW methodology they agreed to support them in a presentation to the Centre’s Board. This included comparisons to wages in other climbing centres, and offered the LLW calculation as truly grounded in the reality of workers’ lives. They stuck to their demands for full implementation of the Living Wage across the company. Management had originally argued that to implement the LLW they would have to increase prices, and so lose customers, but workers, who asked for access to company management accounts, were able to argue that these clearly demonstrated enough income was generated each year to afford LLW implementation for all staff, and for a pension contribution. Furthermore, management attitude was in opposition to the company’s own commitment to ‘sustainability’, receptivity to staff needs and ethical treatment. Faced with a well-organised, articulate and consistent work-force management finally saw sense and within a few weeks agreed to workers’ proposals. This is a big success and testimony to the persistence, self-motivation, and organisational skills of the climbing centre workers. They organised their own victory, put together complex proposals and presentations, properly consulted amongst themselves, made accurate records, and demonstrated to a less together management how an open, transparent and well-communicated decision-making process, works. But, as ever, there is still work to do. The Centre has yet to sign up to full LLW accreditation, there are still problems with the calculation, and pay review processes and shift patterns have yet to be fully addressed. Despite inevitable fatigue workers remain determined to sort out these outstanding issues, keep their organisation tight, and the union strong.